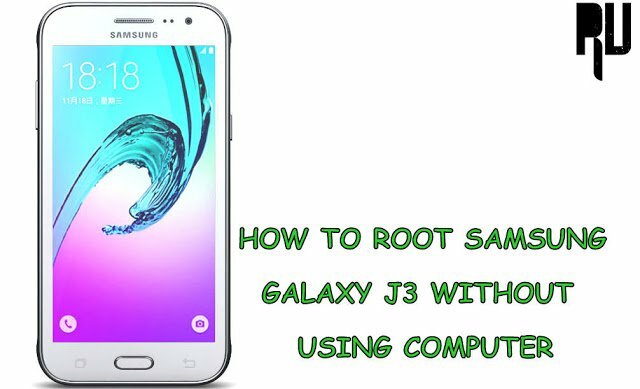 How to Root Samsung Galaxy J3 Without using Computer . Root Samsung Galaxy J3 without using Pc . 1 Root Samsung Galaxy J3 without using Pc . 1.1 How to Root Samsung J3 easily . 1.1.1 Steps to Root Galaxy J3 . Do you want to root Galaxy j3 ? if yes then you are at right place . Today we are here with the Guide on How to root Samsung J3 without Pc . There are basically two variants of the J3 one is the Samsung Galaxy J3 2015 and the another one is Galaxy J3 2016 both the smartphones come with almost same specifications . There are many benefits of rooting the phone like after rooting the device you can Update samsung Galaxy J3 to Android Nougat 7.0 by installing rom , you can change looks of your smartphone the way you want it to be and many more . So lets start the guide on How to Enable root Access on Samsung galaxy J3 . How to Root Samsung J3 easily . Related : List of Samsung Devices Updating to Android N 7.0 Nougat . Twrp recovery is required to flash the J3 rooting package . Minimum 65% battery is required to root the phone . This guide is only for samsung galaxy j3 . Download Galaxy J3 rooting Package . Steps to Root Galaxy J3 . First of all Boot your galaxy J3 in recovery mode . To boot in recovery first of all Turn off the smartphone . Now press Power + Home + Volume Up button together . Dont release the keys until you see Samsung logo on the screen . Now You will enter in recovery mode . Now Choose Wipe cache option . After wiping the cache tap on Install Button . Now Choose the rooting package . Thats all !! You have successfully Root Samsung Galaxy j3 2015 , 2016 easily . You may also like : How to Increase battery backup of samsung smartphones . So this was our guide on How to root Samsung galaxy J3 without using pc , I hope you liked our guide . Will this work out j3 emerge for boost mobile 2017?